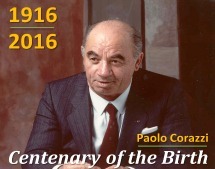 2016: the centenary of the birth of Paolo Corazzi. Founder of the company and Grand Officer of the Order of Merit of the Italian Republic, Paolo Corazzi has been official fighter in Etiopia and decorated with two brass medals and a war cross for bravery. He left a testimony of his life in East Africa by writing a book titled “Etiopia 1938-1946” published by Mursia with a preface by Piero Chiara. Man of culture and lover of art, he has fulfilled several posts as president in many scholarly circles, among which “Rotary International” in Cremona and “Benedetto Croce”.